This comfortable studio is situated in a terraced house in the quiet area of Trzin, next to the creek and forest with walking paths. In the immediate vicinity there are recreation ground and playground. In front of the house there are 2 covered private parking spaces. Studio is in the attic floor with elevator access. 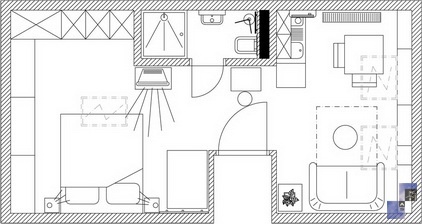 It is divided on sleeping area with double bed (160 x 200 cm) and living area with sofa which falls down to a bed (120 x 200 cm), a dining table and kitchenette with two electric cooker and refrigerator. 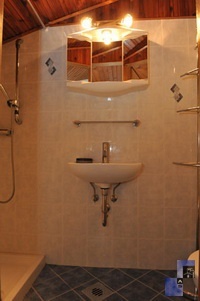 A bathroom has a shower, toilette and wash basin. The studio is equipped with air-conditioning, CTV, telephone, free broadband wired and wireless (WI-FI) internet access 8/1 MB, bed linen, towels and cutlery. The guests have the access to the washing machine, iron and ironing board in the common hall downstairs. 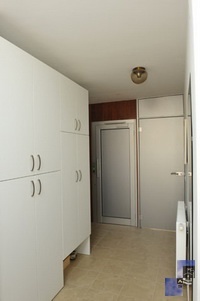 The elevator to the studio is large enough to transport a person in the wheelchair and the guest can use the large bathroom at the entrance in the ground floor, which is suitable for disabled persons. Behind the house there is a forest with trim track and many walking paths which lead to the hills Onger, Dobeno and Rašica. There is also a small pond, which is frozen in the winter and local ski slope for children. 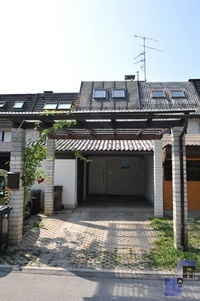 It takes only 15 minutes walk to the industrial zone Trzin, 5 minutes by car to Mengeš or Domžale and about 20 minutes by car to the center of Ljubljana or Brink airport. Majda, thank you very much for all. I really like a lift.